Boston, MA – November 14, 2014 – Boston Children's Hospital, in partnership with the Ryan Seacrest Foundation (RSF), announced today the grand opening of a new state-of-the-art, 943 sq. ft. multimedia broadcast studio named Seacrest Studios. The studio features five guest microphones and high-production-quality video cameras, which will give patients the tools to create a variety of media projects. A special invite only ribbon-cutting ceremony will take place today and will feature appearances by TV/radio host and producer Ryan Seacrest, Usher, The Swon Brothers and Shawn Mendes. Seacrest Studios at Boston Children's will operate under the closed-circuit hospital TV station channel 19 and will broadcast entertainment programming throughout the hospital, which will allow patients who are unable to leave their rooms to still be part of the fun. "We're so excited and proud to be opening our eighth broadcast media center at world renowned Boston Children's Hospital." "Providing our patients and families with the best possible hospital experience during their stay is an absolute priority for us. The addition of Seacrest Studios is a wonderful way for our patients to be active while they recover," stated Sandra L. Fenwick, Boston Children's President and CEO. "Keeping your spirits up is an important part of healing, and we're so grateful to the Ryan Seacrest Foundation for making this broadcast media center a reality." 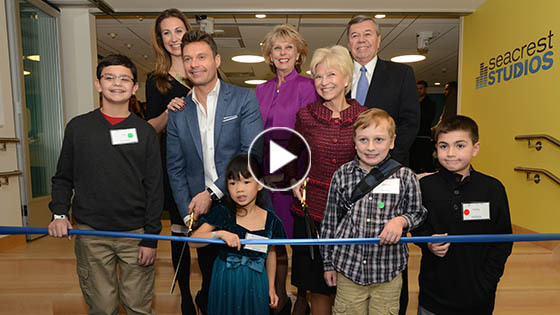 "We're so excited and proud to be opening our eighth broadcast media center at world renowned Boston Children's Hospital," said Seacrest. "Sometimes patients get bored during their stay at a hospital; they miss being active and just being kids. We hope the studio will serve them as not only a welcome distraction, but as a constant source of fun and inspiration." The studio is part of an entertainment initiative that radio and television host and producer Ryan Seacrest and his family developed through their Foundation to help patients explore the art of radio, television and new media. Boston Children's patients will be involved in the on-air activities, giving them a chance to express their creativity. The studio is located on the pavilion level above the main lobby next to the Patient Entertainment Center. The studio will have a dedicated full-time program director to manage programming that will provide young patients an opportunity to engage in activities related to radio and TV. From being a disc jockey, and airing their favorite songs, to watching artists perform live and interviewing celebrity guests, they'll get to do it all. The Ryan Seacrest Foundation has opened seven other Seacrest Studios across the country along with the help of their founding sponsors, E! Entertainment,The Coca-Cola Company, and iHeartMedia.